Spiral-bound notebooks are commonly used by students of all ages for class notes and assignments. 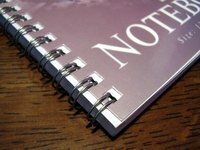 While spiral notebooks are a convenient way to keep information organized, their plain, solid-colored covers lack style and personality. Decorating the covers of spiral notebooks adds a one-of-a-kind touch, and it makes the notebook stand out so you can tell it apart from others. All you need are some basic craft and scrapbook supplies. Measure and cut a piece of printed scrapbook paper that is equal to the size of the notebook's cover. Measure from the inner edge of the spirals to the outside edge of the notebook as well as from bottom to top edges. Apply a coat of glue to the back of the cut scrapbook paper. Align the edges of the paper to the cover edges as you adhere the paper. Run your fingers across the paper to smooth out any wrinkles or creases. If any edges peel away from the notebook, apply glue to the underside of the paper and press the edges down firmly with your fingers. Use alphabet stickers to spell out your name, or the class or subject the notebook will be used for, across the center of the front cover. Measure the width of the notebook from the inner edge of the spiral binding to the outside edge of the cover. Cut a length of craft ribbon equal to that measurement. Apply a coat of glue to one side of the ribbon. Adhere the ribbon to the cover directly under the alphabet stickers. Decorate the cover with three-dimensional embellishments such as paper flowers, rhinestones or decorative brads. When selecting the printed scrapbook paper, ribbon and three-dimensional embellishments, choose colors and designs that will coordinate well with one another. It's time to load those backpacks and pack those lunches, Summer is over. Head back to school with stylish, customized notebooks.